This post has been in my 'drafts' folder since before the Olympics. We're all over that now but I will post anyway. Like these two ladies here, I have also been sportier than you'd expect recently. In the spring, I had my long neglected bike tuned up and got new tires, brake cables and a carrier installed (see, this blog is not the only thing I neglect). I am not a very confident urban cyclist and I live in a very busy area so I usually ride around on Sunday afternoons when traffic isn't too intense, and I plan out my bike-friendly routes ahead of time. I use the 'Map My Tracks' app to get an accurate record of the distance. Yesterday I rode for 20 km which is pretty far for me. 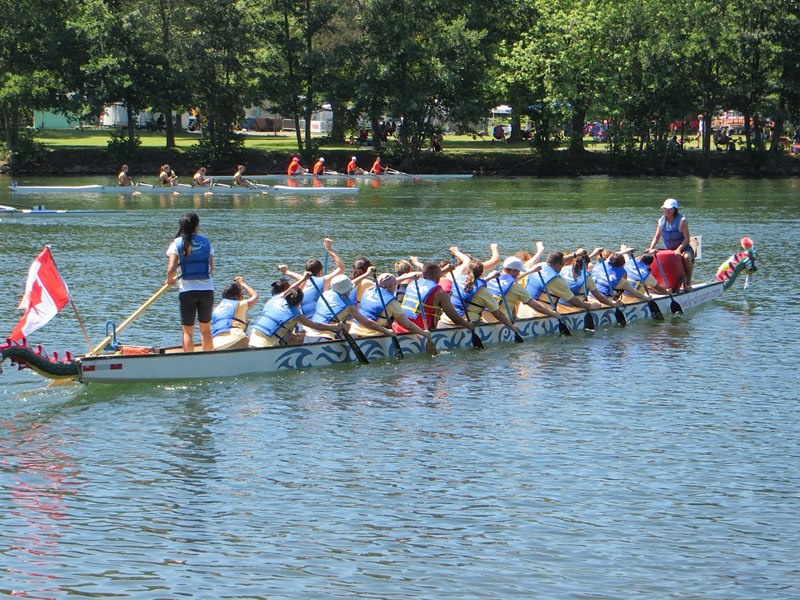 At the beginning of the summer, I joined the dragon boat team at work. It seemed like fun although it involved team camaraderie which I usually avoid. It was my first time going out onto Lake Ontario in a small watercraft which is crazy given I've lived here well over ten years. It was so pleasant out on the water in the high heat of summer even if the practices were exhausting. We had eight training sessions, learned how to paddle correctly, how to sprint and how to start races. Then there was the regatta where we raced for real. My team had three races - two heats and a final. The racing was an incredible rush! Twenty of us pulling in unison with all our strength and more, everybody screaming, water splashing, the other boats right beside us doing the same. We won one of the heats and it was a real thrill: the euphoria of complete exertion. I don't know if I'd do it for another season but it was definitely worth trying once. Other athletic endeavors: an archery lesson, an alumni Kendo practice to test if I'm up to going back to twice weekly (I'm not) and a 5K training program for the gym treadmill. I'm using the 'Ease Into 5K' app although I have to do each week's training twice over because of my asthma. Maybe one day I'll be able to run for longer than three minutes? When I first got my bike tuned up, I rode around the Deer Park neighborhood and then down Avenue Road which is a very steep hill. I strained my forearm from braking hard on that hill. How ridiculous is it to injure your arm while cycling (I mean, when it doesn't involve a crash)? Combined with the paddling, archery, kendo and daily lifting of massive project files at work, this turned into a painful and lingering case of tendinitis (tennis elbow/lateral epicondylitis). Months later, it still isn't healed so I've been staying away from the weight training I usually enjoy. 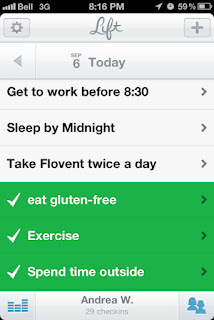 Clearly I like using apps to keep myself motivated while being sporty. I just started using the 'Lift' app which lets you create a list of daily goals. I think 'Lift' could really help to set good habits and break bad ones. Here's my current goal list. I'm on a ten day streak for "Exercise" and "Sleep by Midnight"! 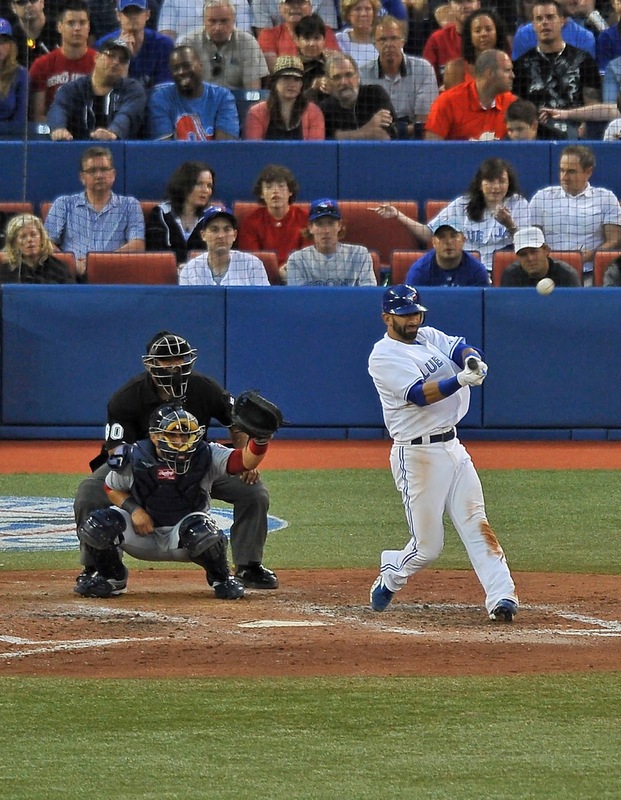 Bonus sports-related pic: here's Jose Bautista hitting a home run for the Toronto Blue Jays as witnessed by my dad and me. I'm in the fedora and pink cardigan.